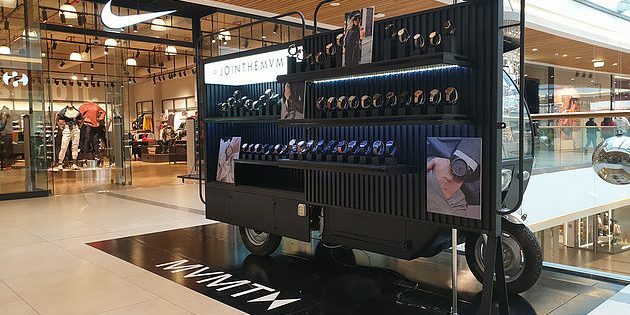 Realizing the need for outdoor customizable marketing solutions in the Lebanese market, our team set out to fill that gap by designing and building two tuk tuks that can fit anywhere, and are guaranteed to help businesses achieve their marketing goals. Our customizable Tuk Tuks were ready just slightly before summer and they have been the highlight of many events and marketing activations since. Now, Helix has been chosen by MVMT as their main creative stand for their launch in Beirut, Lebanon. first time in the Middle East, in all inédit branches in Lebanon. For their launch in Beirut, Helix has been chosen as their creative stand to grab attention and spread awareness. Helix can be found in ABC Verdun from December 6 to January 6, displaying stunning fashionable watches. Pass by ABC Verdun to check out Helix and MVMT!